How could life have begun? Some people think it was carried to Earth from another planet. But that just puts back the problem of how life began to that other planet. It is simplest to assume that life began on Earth. Indeed, the Earth has the right conditions for life to exist. It is at just the right distance from the Sun for water to be a liquid, and its orbit is almost circular. This is probably unusual among planets round other stars, so it seems sensible to assume Earth was the place where life began. We start with some of the commonest atoms in the Universe: hydrogen, oxygen, nitrogen and carbon. These were assembled into smaller molecules, amino acids and bases, which were eventually built into large molecules such as proteins and nucleic acids. These molecules were certainly present in the atmosphere released by the volcanoes of the young Earth. This atmosphere probably contained molecules such as methane, ammonia, carbon dioxide and water, but not oxygen molecules. Experiments show that energy such as lightning can create amino acids and bases out of these simpler molecules. They were washed down to Earth in the rain. There they were joined together to make nucleic acids and proteins, perhaps by being heated on the slopes of volcanoes, or on the ocean floor where hot rock rises from the Earth�s mantle. Life as we know it is a chemical system which needs both proteins and nucleic acids working closely together. 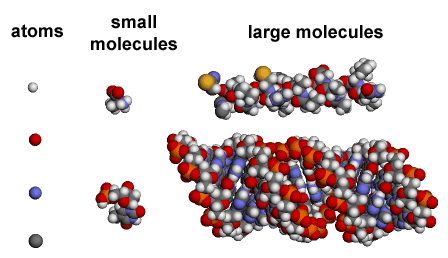 But perhaps, before life began, there was some simpler system which just used one type of molecule. One idea is that nucleic acids stuck to clay. This was an adsorption process similar to the one we saw when atoms stuck to stardust. A chemical system might have begun which could grow and reproduce without the use of proteins. This type of theory is popular because nucleic acid sometimes acts like an enzyme in life today. Perhaps later life began to use proteins as the workers, and these gradually took over all the jobs of life, leaving the nucleic acids as mainly the information carriers. Clay stopped being used, and modern life began. We do not know whether this theory is correct. It raises many questions. How did those first nucleic acids form? How did they begin to use proteins? Was there a stage of life before nucleic acids, and what chemicals did it use? Is life common on other planets in the Universe, or did it only begin on Earth? It is not clear when life began. We guess that it was soon after the meteorite era ended, about 4 billion years ago. All traces of early life on Earth have long since been wiped out. One reason for exploring other planets is the hope that they will show us life at an early stage of formation. Could life exist on other planets? Our Milky Way Galaxy contains 200 billion stars. If even a small percentage of them have Earth-like planets, then our galaxy could contain many Earth-like planets. Some of them, perhaps, are at just the right distance from their star to be warmed to lukewarm temperatures where the water could be in liquid form and perhaps life could flourish once it had begun. Of these, some must have circular orbits (like the Earth) rather than the more common oval (elliptical) orbit. But since we do not know how life began, we cannot say how probable it is that it could begin on these other planets. 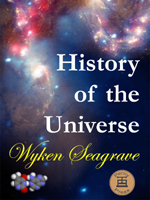 How life began is another of the great unanswered questions in this whole story. Some scientists are trying to create artificial or synthetic life on Earth. In 2010 the J Craig Venter Institute created synthetic DNA which they inserted into a bacterium. However this is still a long way from creating a complete cell from simple chemicals. And even if they managed to create life in a laboratory, scientists would still be a long way off explaining how life began, when only nature�s laboratory existed.